How does pregnancy bring about cravings for things that you’ve never had? When I was on my new love of canning craze last summer and fall, I canned a bunch of homemade brown sugar applesauce and it still sits in my pantry. I’m not one to eat applesauce straight from the jar, I enjoy it with pork and in desserts…so I figured I needed to make some muffins to satisfy this odd craving I’ve been having. 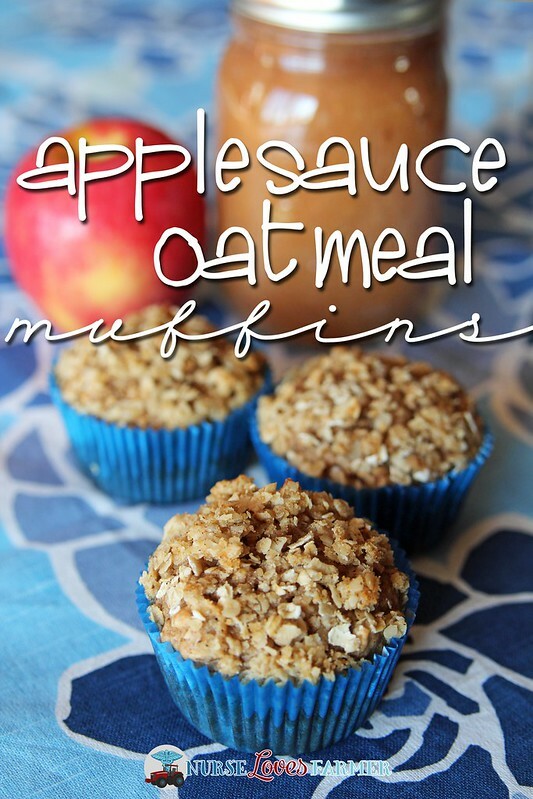 So, since I’m always a fan of oats, I present to you: applesauce oatmeal muffins! Preheat your oven to 400ºF and line 18 muffin tins with paper muffin liners or spray with canola oil. Mix all of the dry ingredients together: oats, flour, brown sugar, baking powder, baking soda, cinnamon and salt in a large bowl. Then add all wet ingredients: applesauce, buttermilk, canola oil and vanilla and carefully mix until just incorporated. Take a large scoop of muffin mix and fill each cup ¾ full, I like to use a large cookie scoop so the muffins are equal in size. 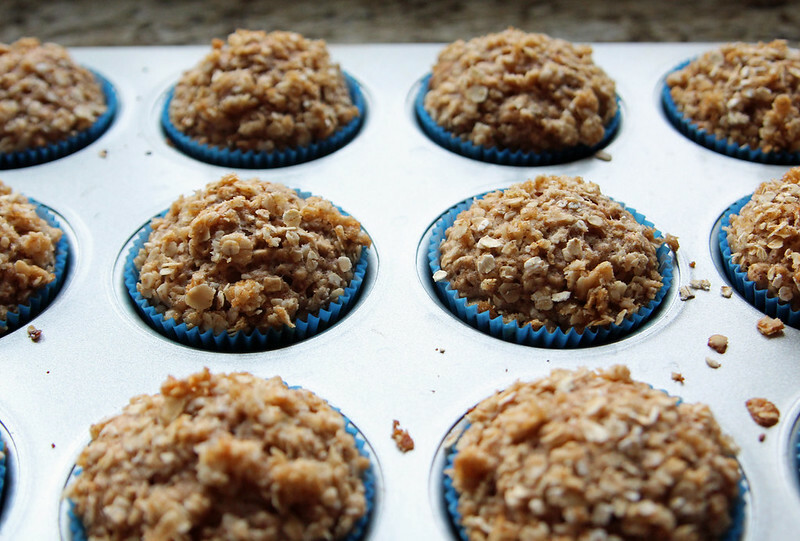 These muffins really don’t rise a lot, so fill them ¾ and don’t worry about spillage! Now you can make the streusel topping buy combining all ingredients in a medium bowl and cutting them together using a pastry cutter, fork, or butter knife. Generously sprinkle streusel topping on each muffin and muffin trays in oven for 15 – 18 minutes, 15 minutes was perfect for mine. 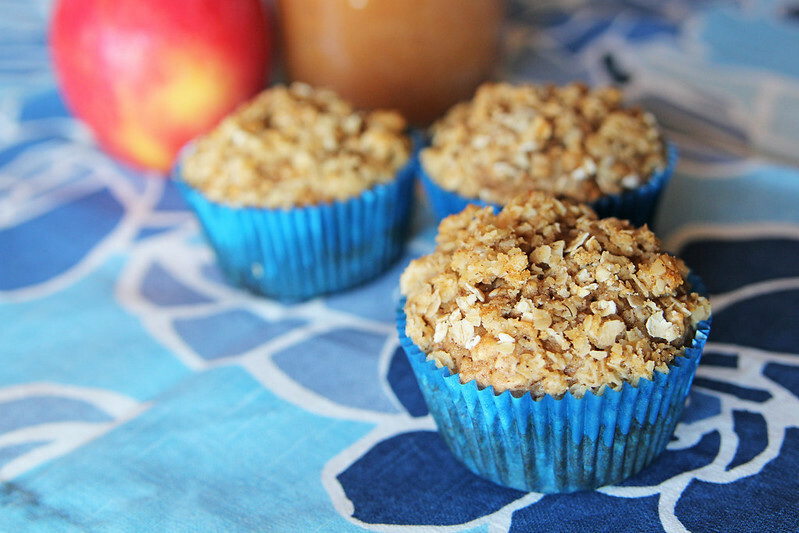 Applesauce oatmeal muffin are moist, delicious and sweet with a bit of a crunch in the streusel topping! A great way to start the day or send for a snack. Preheat your oven to 400ºF and line 18 muffin tins with paper muffin liners or spray with canola oil. Mix all of the dry ingredients together: oats, flour, brown sugar, baking powder, baking soda, cinnamon and salt in a large bowl. Then add all wet ingredients: applesauce, buttermilk, canola oil and vanilla and carefully mix until just incorporated. Take a large scoop of muffin mix and fill each cup ¾ full, I like to use a large cookie scoop so the muffins are equal in size. 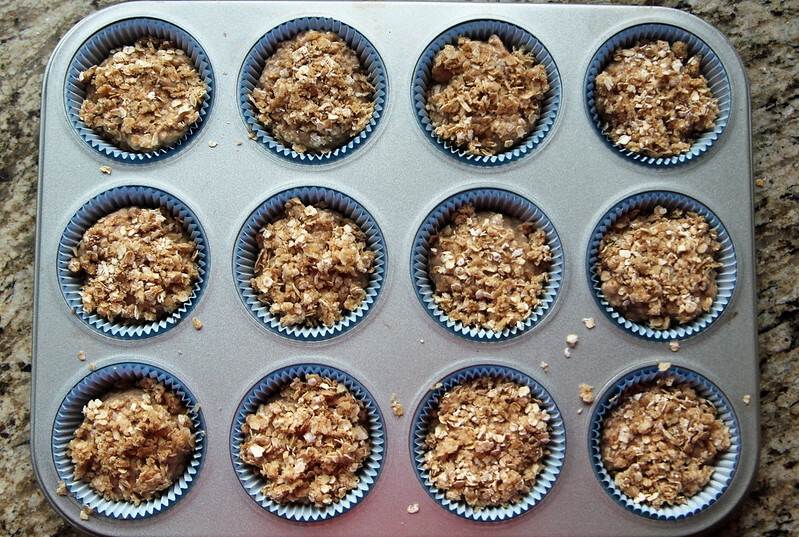 Make the streusel topping by cutting ingredients together in a small bowl with pastry cutter, fork or butter knife. Generously top each muffin with streusel mix. Bake in oven 15-18 minutes or until centre of muffins come out clean when poked with a toothpick. Adapted from Eating on a Dime. These are some of the prettiest and tastiest muffins I’ve ever made and the kids just loved them too! Hope you enjoy!